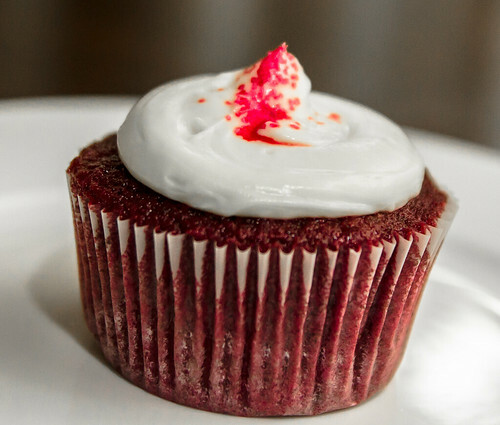 Red Velvet Cupcake from My Cousin’s Bakery, a photo by Myra Golden on Flickr. Last night we had my son’s 9th birthday party. He loves Red Velvet cake, so I ordered a dozen Red Velvet cupcakes from my cousin. She’s just started a baking business from her home and from what I saw in this transaction of Red Velvet cupcakes, she’s off to a smart start. My cousin delivered the cupcakes to my home in rush hour traffic to get the cupcakes to us right before the 6pm party. She didn’t even charge a delivery fee. The on were packaged in a beautiful dusty pink, sturdy box. The packaging WOWed me. Her shirt matched the color of the box and had a giant cupcake made out of jewels on the front. She told me she made the shirt herself. My cousin’s packaging was as professional as I have ever seen for a bakery. She was friendly and had a genuine spirit of service. As my cousin walked out the door, she asked me if I would give her feedback on her cupcakes. I said, “of course.” She said, “Thanks. I really do want your feedback.” I could tell she meant it. And the cupcakes…Oh my goodness! They were moist, sweet, and a real delight in every bite. One of our guests ate 3 cupcakes! Making a great impression with first-time customers is essential and my cousin, Kimberly, gets this. Take a lesson from my cousin and ensure your packaging is top shelf. Packaging includes everything from your website, physical location, employee wardrobe, product package, and any and everything your customers see. Make sure you present the best possible image. Add to packaging a true spirit of service, and you’ll be a smashing success. I’m asking you because my newsletter offers ideas like this all the time. If you’re not yet subscribed, sign up here. Myra, you are so giving and caring. Thanks for taking your business seriously and sponsoring those who provide great customer service with YOUR feedback. It will promote those who are well deserving. The cupcake looks awesome. Say happy birthday to Warren for me. Previous Previous post: The Issue Is Not the Issue. How the Issue Is Handled Becomes the Issue.